Do You Need A Marketing Kit? One of the requirements for using the beacons for your proximity marketing, is that you must have a secure site. (Google owns the systems for android smartphones and each time someone turns on their phone, they are automatically opting into proximity marketing. This covers all legalities of the use of beacons ). A lot of small business owners, entrepreneurs and internet marketers are still not set up with a secured site. That will work unless you are collecting monies on your actual site or to use the various beacons to drive more customers into your store or onto your website. There are other reasons as well, but for these two actions, there is no way around the expense. You have to have a secure landing site. Genusity offers a complete marketing package, a $300 monthly value, that includes a variety of secured mobile sites, that are set up for your use for any type of business for $15 a month. This low monthly price solves the dilemma of having a secured site and at a low cost. There is no markup for profit. Retail Stores, Restaurants, Businesses, Stadiums, Realtors, Car Lots, Flower Shops, Restaurants, Hair Salons, Pizza Drivers, Taxi Drivers, Trade Shows, Health Fairs, Parking Lots, Grocery Stores, E commerce … the list is endless. 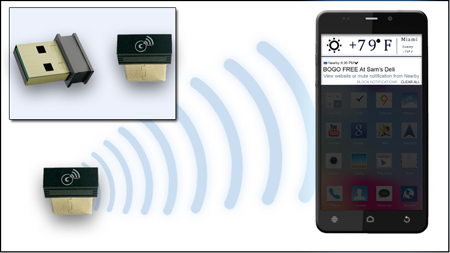 Use the BOOM to transmit your Ad to every Bluetooth/Nearby enabled cell phone up to a 250 foot radius of you.